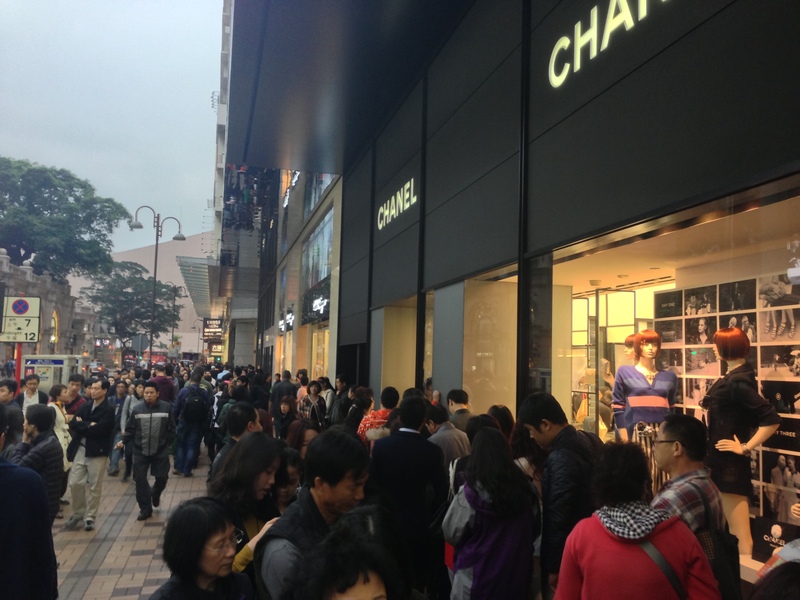 One thing quite hard to understand as an European in Asia is the attitude towards luxury brands. I’m from Germany, home of BMW, Mercedes, Porsche, RIMOWA and other brands. But you haven’t really experienced what it means to “love brands” before coming to Hong Kong. 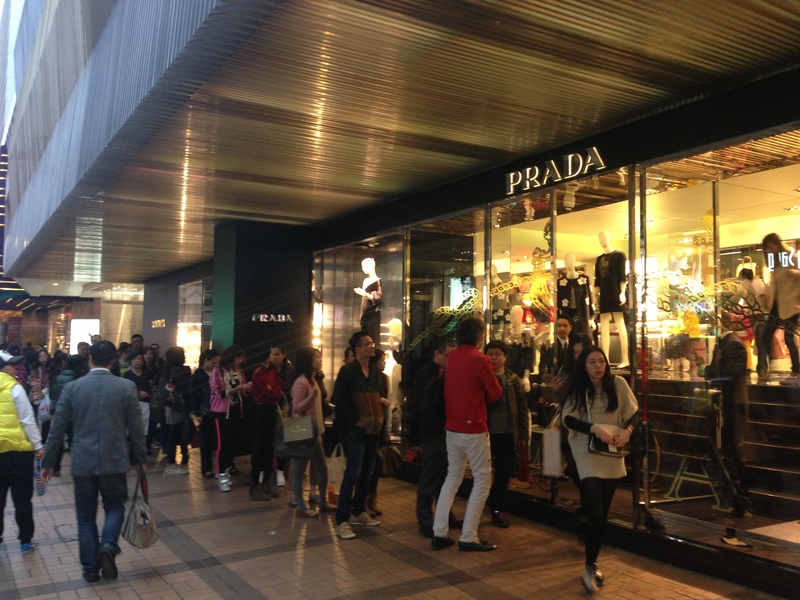 Have you ever lined up to enter a Prada shop just to spend your money? No? Well, here you do…. Last weekend I was in Tsim Sha Tsui, one of the main shopping districts in Hong Kong where you find Prada, LV, and all the other brands I forgot. To be honest, I don’t really care of brands. The only exception being my Apple stuff. In my defence, I have to add that I’ve been a Mac user long before the iPhone and iPad came out, hence long before it became “cool”. I have a passion for design though, hence I like what a lot of brands came up with (e.g. BMW motorbikes). I’ve asked myself many times why Asians are in love with (mostly European) brands. Not just cars or electronics, it’s everything. Clothes, handbags, glasses, cosmetics, toys, alcohol. And a lot of the stuff is either pre-made or entirely made in China anyway. A year ago, I met a guy producing sun glasses for famous European and American brands. “Made in the U.S.A” and “Made in Italy” I read on the frame. I asked him whether that is permitted, since evidently it isn’t produced in Europe or the U.S. at all. “Of course it’s legal”, was his reply. “I send the frame in three parts, they put in two screws in the frame in Europe. Given the high labour costs in Europe you can argue that most of the value was produced there, that’s why it’s made in Europe”. I had a lot of discussions with local friends about brands. The argument is always the same: “Yeah, but it’s a brand. It should be better quality, right”? But does higher quality really justify a price that is 20 times or more above a no-name product? Why are people willing to spend so much money on that stuff? And people spend their money here like crazy! RIMOWA, a German manufacturer of aluminium suitcases sells their products here in Hong Kong. But the price comes at a 20% to 30% premium over the retail price in Germany. And in Germany, the price includes 19% tax. Here in Hong Kong, there is no sales tax (nor VAT or GST). And, in contrast to Mainland China, there is no import tax either. Hence, the price you pay in the shop is the net price. One explanation I came across about Asia’s love with luxury brands is “face”. “Face” is an important concept in Asia but almost unheard of in Western societies. “Face”, i.e. your standing in the society, is expressed through what position you have in society, whom you know and how much power you can command. Nowadays, it boils down to money. And brands are a fantastic way to show your face. One drastic example? When China raised the import tax on expensive (mostly German) cars, demand for these AFTER the tax was introduced skyrocketed. Why is that? Economic theory explains that if you raise the price, demand should go down. But here it’s different. If the car you want suddenly costs 50% more you can show that you can really afford it! So you loose money, but gain face. I guess that’s one of those topics which I will never understand. However, given Europe’s troubles, I should be glad that someone is buying our overpriced products. But I wonder how long that will last. Will Asian consumers one day understand, that the difference between a branded product and a no-name product isn’t that much? It’s a status symbol thing isn’t it, to prove to everyone how rich you are that you can afford to pay that much for things? And if you can’t afford it you can always buy the fake version and pretend..